S'mores & shrinky-dinks...two of my absolute favorite things! And, when a fire is not available, use your stove-top! My girls & I enjoyed these all weekend! It was a regular carnival around here! I tried a new method-the microwave. Believe it or not, the microwave directions are printed on the graham cracker box. This technique makes the marshmallow a little more sticky & gives a slight rubberized texture. It's only slight though. I was also able to try out some new shrinky dink paper I got at my local "Cartridge World" store. I was getting new inkjet cartridges for my printer & there were 2 walls filled with all sorts of interesting things such as transfer paper, puzzle paper, bake-n-shrink paper, photo paper, canvas pages, etc. The shrinky dink paper is white & I hadn't ever used it in my printer before so I was excited. The sales lady showed me a biz card she had printed & shrunk--so cute! And, you could punch a hole, add a keyring &---*insert magic word*---you have a great advertising tool! -The sales lady told me to adjust my color on the computer & make it a bit lighter than I would want the "end" result to appear. When the dinks shrink, the color intensifies. -Watch the little guys in the toaster oven at all times, don't even blink. The process happens quickly. -They will smear. The sales lady did tell me this. I touched the end of one with a wet finger. (OK, I slobbered all over my finger & touched it!) Indeed, it smeared. -They came out with a "yellowish" tint, almost greenish looking. In other words, a real sick color. I sanded it a bit & that helped. Usually discoloration means you cooked 'em too long, but I'm pretty sure I was right on top of getting them out quickly once the shrinkage was complete. -The sales lady did tell me I'd need to coat with a clear sealer. I sprayed some clear stuff on them, & that did the trick. -Next time I think I'll print something a little less large. -I think they'll look adorable with some bead or charm embellishments & a keychain! Oh my gosh! My hubby loves making stove top smores with the boys!! He is the marshmallow King! mine always turn out too burnt. I used to love shrinky dinks! I remember making a ton of "Barbie" ones once!! too much fun. I have never done a shrinky dink, they look addictive. 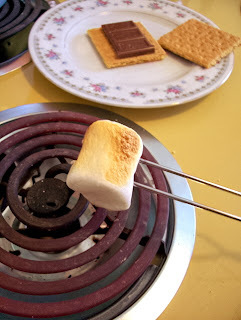 wow, i love love love smores, and shrinky dinks! ahh the memories of childhood! Thanks for the lovely comment, your blog is wonderful! Shrinky Dinks are fun. I wish there was a good way to control them so they wouldnt shrink with warping. Preheating pan and using a liner has helped some, but no guarantee. 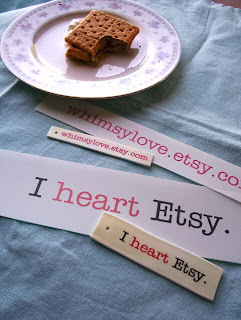 BTW, here from the Etsy Blog Roll list.